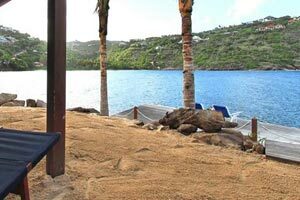 Villa UJV 249, also known as SeaDream is an independent bungalow located on the estate of UJV 249 WYB in Marigot. This one-bedroom villa offers a private pool and terrace overlooking Marigot Bay. UJV 249 WYB has its own private beach, where guests can relax in a shady Balinese-style gazebo with recliners and barbecue, surrounded by mature palm trees. Access to the bay is shared with the main villa (UJV 249 WYB), although UJV 249 features its own private garden, covered parking and private access. The bedroom is furnished with a king bed with air conditioning, and large bathroom with large shower and lounge area. 1 minute - Lorient Beach.